An interesting marginal plant. 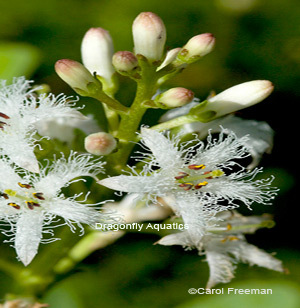 The flowers stand 2-6 inches taller than the leaves giving an overall height of 6-10 inches out of the water. Olive-green leaves with pink clusters that open to white, fringed, star-shaped blooms that are highly fragrant. Flowers appear late May through July. It may freeze solid in winter as long as its in the water.